The delightful spread at A Taste of Britain - a culinary extravaganza hosted by the British High Commission and Taj Palace - was an exercise in gluttony. What is it about fish and leeks that is so quintessentially British? Cod and salmon can possibly profess to have the stiff upper lip, though it's more of a pout, and leeks are delightfully dour. Now, I use dour in the most flattering sense. Leeks are of a sullen disposition and refuse to yield an inch of flavour till you gently coddle it in a pot of boiling water. Or, so it seems to us spice-saturated Indians though many take on the appearance of a sweaty lobster when confronted with masala-laden curries. That's exactly what we're staying away from as we explore the many dimensions of British cuisine . The delightful spread at A Taste of Britain - a culinary extravaganza hosted by the British High Commission and Taj Palace - was an exercise in gluttony. On a Tuesday afternoon in late August, the opulent interiors of Kafe Fontana softened by intermittent chatter and sunlight streaming through ornate French windows harboured a table set for a king. A peek under the warmed cloches yielded a rich aroma wafting up from cheese-laden crusts and glazed meat. World Master Chefs Society vice president Daniel Ayton, the host of the extravagant repast, elaborated on the intricacies of the cuisine and the hallowed role that fish play in their diet. Steamed in soups, baked into pies, roasted and grilled, it almost gives beef a run for its money. I say almost, because steak with mashed potatoes is a Friday night staple that Britons love to indulge in. Chef Ayton admits that the provenance of British cuisine is not above a little purloining here and there (read Welsh and Scottish). They have given us tea and a permanent licence to prolonged, leisurely tea breaks, so we'll look the other way when it comes to their source of culinary inspiration. The charm of roadside-brewed tea can never be replaced by coffee, the bane of the USA, no matter how heady its aroma. Translating a repertoire of hearty flavours into a versatile archive of gastronomic elegance is a noble undertaking, strains of which run through the crumble-like goodness of cottage pie. Talking of pie, did you know the abiding American symbol of home and hearth - apple pie - is a quintessentially British dessert? The Puritans took it to the new land and never really brought it back. Now, that's one thing the British and Americans have put behind them and there seems to be no hard feelings either. When you have a traditional sherry trifle, there's no reason to cry over the loss of the apple pie. 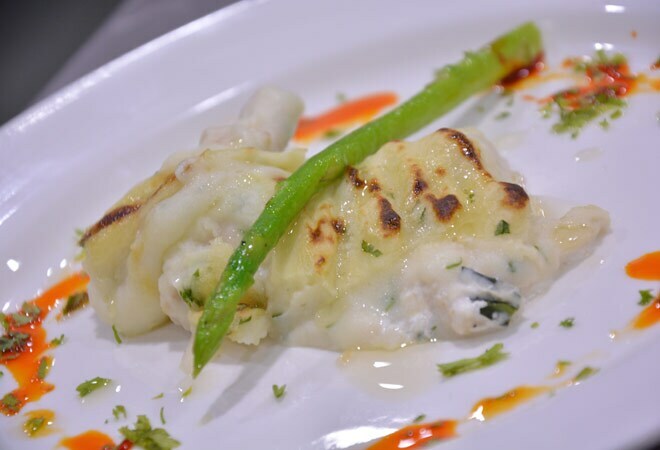 Successfully straddling the spectrum of hearty home-cooked meals and nouvelle cuisine, British cuisine is in the habit of whipping up perfection with minimal ingredients. Take, for instance, the humble fish pie. The texture of a savoury crumble with silken layers of fish is something any fish lover's taste buds will clamour for. The Billingsgate fish pie encased in a sheath of browned cheese and dotted with farm fresh veggies was a toothsome opener. This was followed by a version of the cullen skink - a fragrant and runny haddock and saffron broth perfect for cold nights. Vegetarians would love the vegetable crumble with basil - a beautifully seasoned bake. The peppers stuffed with rice and portobello mushrooms had a slight Asian twist. 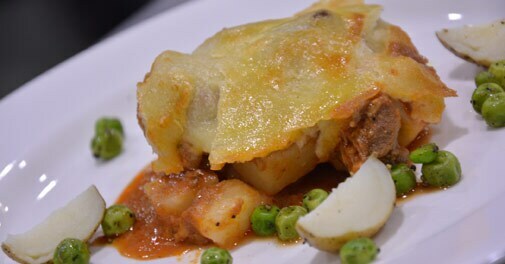 Stuffed with lamb and potatoes laced with tomato puree, the butcher's pie encased in layers of puff pastry was a lovely contrast of textures. The sweet note was provided by sherry trifle - a decadent, layered dessert with sherry-soaked sponge and fruit drizzled with custard. 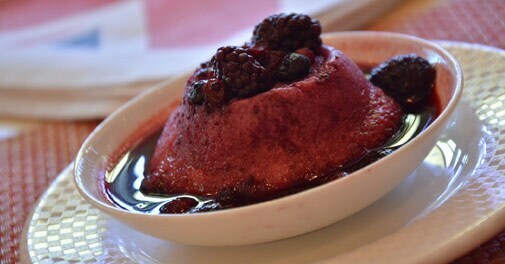 The gorgeous tang of the light summer pudding without the clotted cream was just as refreshing. The assorted cheese platter had interesting variations of each kind - Blacksticks blue, black bomber cheddar, cornish yarg, red leicester and Sussex blue. Their varying degrees of acidity and moistness are best sampled with a glass of red wine. Chef Ayton ends with an exposition on the trend of tempering tastes across cuisines as we move towards a global palate. Global cuisine is admittedly edging towards France, but I prefer the English way.